Thursday we were able to finally get started on some soybeans to allow the corn to dry down. We have a little over 300 acres of corn out and it has all been in the 20 to 25% moisture range. The soybeans that have been harvested so far were the first planted and have exceeded yield expectations. 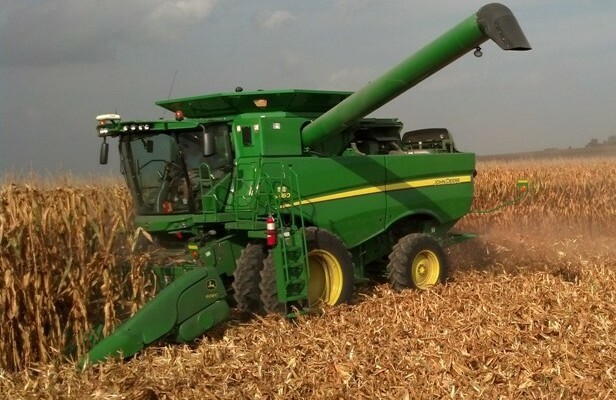 Harvest video links: Corn Combining and Soybean Combining. It has been a busy couple of months and a while since our last web update. Corn harvest got underway Monday afternoon. The moisture is still in the low to mid twenties on the first corn planted so we have limited ourselves to drying on the farm at this point. The yields on the small amount of corn we have taken out are about as we expected when we did our late August yield estimates. The soybeans are still a ways off, it looks like it will be a week to 10 days before they are ready. This morning we are receiving some long overdue rain. By next week harvest should be going full speed.